4 × = twenty eight Required Please enter the correct value. A tool intended to make retirement investing easier may result in many Americans taking an unwitting hit to their portfolios when the bond bubble finally pops. We're talking about target-date funds, designed to be "set it and forget it"-style retirement vehicles for people who don't want to bother with actively managing a portfolio. Such funds usually include a combination of stocks and bonds, with the ratio dependent upon the investor's retirement date. When retirement is 25 years or more in the future, target-date funds typically hold about 90% stocks and only 10% bonds. But as time goes on, target-date funds shift the balance more in favor of bonds, with the intent of reducing exposure to risk and volatility. By the time retirement is 15 years away, the balance is 75% stocks and 25% bonds. And when that nears to just five years away, bonds generally rise to about 40% of the portfolio. So as we edge closer and closer to higher interest rates and the negative impact that will have on bonds - the dreaded bond bubble - many workers approaching retirement are slowly adding more and more exposure to it. 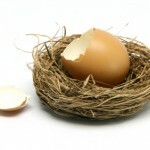 What's more, many future retirees may not even know it.